In July 2014 The Universal House of Justice made significant changes to the The Bahá’í Calendar. This page describes the Bahá’í Calendar as it exists now (since those changes). A separate page discusses how those changes differed from the previously existing calendar systems used by Bahá’ís around the world. The Bahá’í Calendar is known as the Badí‘ Calendar. It is a Solar calendar which means it is based on the revolution of the Earth around the Sun. This point in time at which the sun “crosses” the equator is called an “equinox“; and since the earth is rotating on its own axis, this time differs for different locations around the globe. 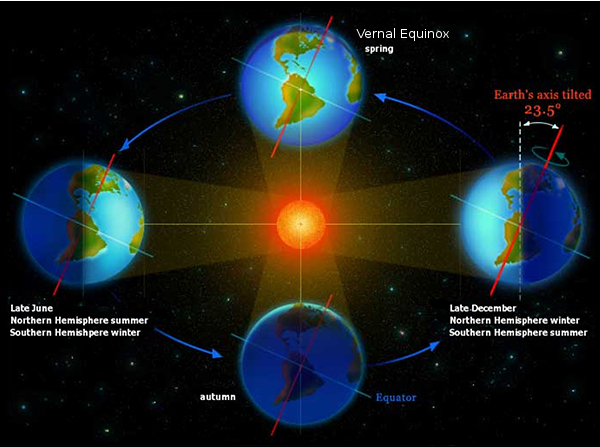 The Equinox at springtime is called the Vernal Equinox. Astronomers can determine the exact time at which this event occurs for any location around the globe. By House of Justice decision, the Bahá’í Calendar begins at the time of Vernal Equinox at Tehran, Persia. In relation to the Western Calendar, the day on which this event occurs can vary from year to year: it always happens on March 20 or March 21 of the Western “Gregorian” calendar. 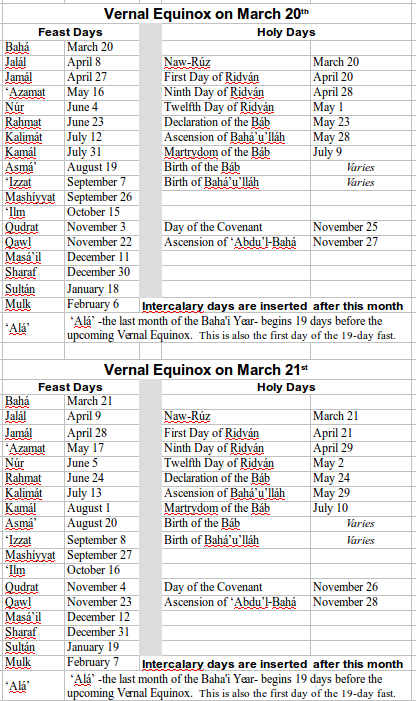 This Vernal Equinox at Tehran is the first day of the Bahá’í Calendar each year and the date of all the 19 Bahá’í Months and of all the Holy days – except for the Twin Holy Birthdays – are directly related to the time of the Vernal Equinox. Baha’u’llah was born in 1817 in Persia. The Persians used the Islamic Lunar calendar. This Lunar calendar was -and is- based on the revolutions of the moon around the earth and in this Lunar Calendar, the first day of the month is based on the ‘New Moon‘. The time that this ‘New Moon’ becomes visible to the naked eye can sometimes vary for different locations and from year to year. Also, since the Islamic Calendar is not tied to the orbit of the earth around the Sun, a month in that calendar can -and does- occur in different seasons of the year and there is no relationship between the months of the Lunar Calendar and the months of a Solar Calendar such as the “Gregorian” or Western Calendar. Diagram showing how the date of the “Twin Holy Birthdays” will vary from mid-October to mid-November over the next 50 years from 2015 to 2065. In 1817, of course, the Vernal Equinox occurred on (or about) March 21, 1817. The Birth of Baha’u’llah occurred on November 12th 1817; according to the Islamic Lunar Calendar of that year, this was the 2nd of Muharram. From the time of the Vernal Equinox of 1817 there had been 8 Lunar months (or “New Moons“) to the first day of Muharram. So in basing the time of the “Twin Holy Birthdays” on a period of eight “New Moons” after the Vernal Equinox of any year, the Universal House of Justice is fixing the celebration at the same distance in time from the Vernal Equinox as it was in 1817 at the birth of Baha’u’llah. However since the moon could be anywhere in its orbit at the time of the vernal equinox, the exact number of days in this “eight new moons” interval can vary considerably and so the dates of the “Twin Holy Birthdays” will move from year to year from mid-October to mid-November. 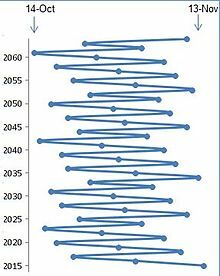 Some kind soul has created a graphical diagram showing this variation graphically for the years 2015-2065. For more details on the Islamic Calendar see this page on the US Naval Observatory Website. The Year begins (“Naw Ruz”) on the day of the Vernal Equinox at Tehran, Persia. Every year this will fall on either March 20th or March 21st. There are “Intercalary Days” which vary in number from year to year (as for “leap years”). See the Table from the Baha’i World Center. The calendar consists of 19 months of 19 days each – starting at the above-mentioned Vernal Equinox. The last month of the year – ‘Ala, which is the month of fasting – begins on the day after the last intercalary day and the length of the intercalary days depends on the vernal equinox for the upcoming year. The dates of all Holy Days – except the “Twin Holy Birthdays” – have been fixed within this Solar Calendar – so like the 19 months of the year, they will only vary based on the Vernal Equinox. Once the date of the Vernal Equinox is known, the Calendar will follow one of two patterns. 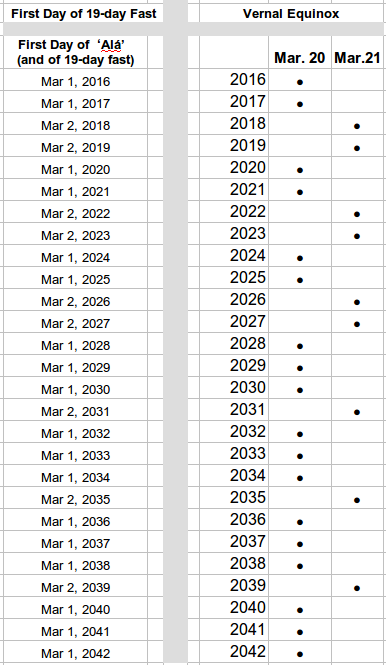 See the tables below to find the calendar for any year – except for the Twin Holy Birthdays and the Intercalary days. See the table above for the start date for the month of Fasting (‘Ala). The information from the above two tables is also available in an Excel Spreadsheet Document (Click here to download it).